When a man wakes up without a pulse and a lot of questions, his only real option is go into the detective business. Well, at least when it's Braineater Jones by Stephen Kozeniewski. The novel, set in 1934, covers a little more than a month in the life of a zombie private eye that will have you dying with laughter. I know, I know, obvious pun. I couldn't resist. Jones is a talk first, shoot directly after kind of zombie. He's a bit naive when it comes to trusting certain people and with the entire undead thing completely. He was shot and left to die in a mansion's outside pool. This being the only thing he knows, Jones is determined to get revenge on whoever murdered him. He's a likeable guy with a bit of a forceful attitude. 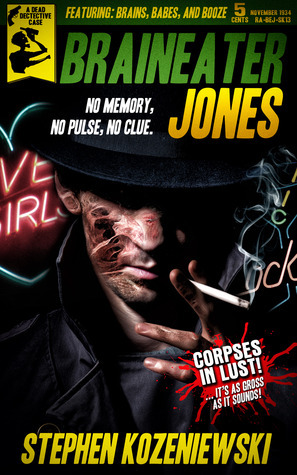 Readers may struggle with forming a connection with Jones, whose real name is not Jones by the way, based on his after death status and desire to uncover his murderer. However, that won't stop anyone from enjoying this book, which is written as the journal of Jones. The plot of the novel follows Braineater's awakening, his stumble into the detective business, and the uncovering of a rather large deceitful bootlegging system. Kozeniewski keeps the book at a quick pace, revealing pieces of the mystery in exactly the right way, keeping readers from seeing the bigger picture until the end. Though, this book is not for everyone. It's definitely full of inappropriate, crude language and adult zombie-style situations. This writing style fits the storyline and book perfectly, but young readers or those who don't enjoy this specific type of humor may want to pass.